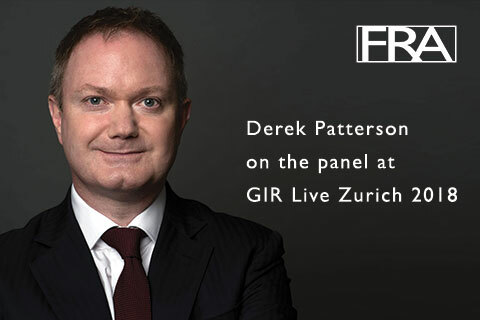 FRA Principal, Derek Patterson, is joining the panel at GIR’s first Live event in Zurich. The event promises to bring together the best of private practitioners and in-house counsel to discuss topics at the forefront of investigations, white-collar crime and fraud. Derek is on the panel ‘Resolving a cross-border investigation: making the right decisions and avoiding the pitfalls’. The panel will focus on resolving investigations and will discuss questions such as; how do you bring things to a satisfactory conclusion, how do you coordinate document collection across multiple jurisdictions, do you alert government regulators, how should you handle multiple government investigations and how can you best resolve government investigations across multiple jurisdictions. Derek will be joined by Marc Mauerhofer, head of anti-money laundering and suitability at the Swiss Financial Market Supervisory Authority, Martina Berli-Stettler, head of litigation and investigations at Swiss bank Credit Suisse, and Lisette van Eenennaam, Deputy Head of Special Investigations and Senior Legal Counsel Integrity at ABB.